We pick up most of our furniture a bit at a time. 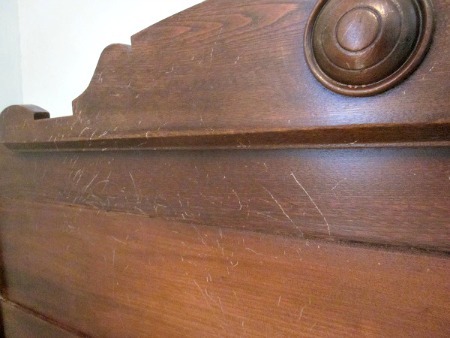 One example is the headboard in Ben’s room. I found it at Marva’s Place in south Minneapolis (recommended–and check out current coupons on their site). It’s a vintage piece, and I like its shape. Panhandle windmill photo by my darling Uncle Bud. 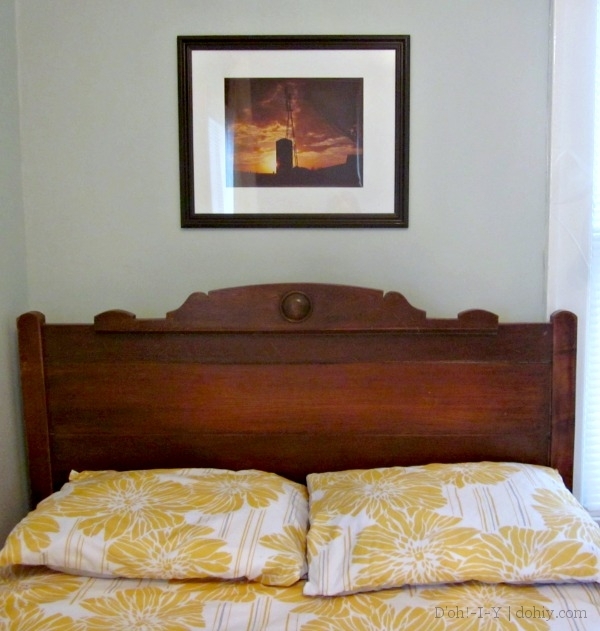 When I first brought the headboard home, I cleaned it and applied some stain restorer. That brought up the shine quite a bit, but it didn’t really deal with the scuffs and scratches, which are significant. I guess Boots and Patches had some crazy nights. If nothing else, I keep myself amused. 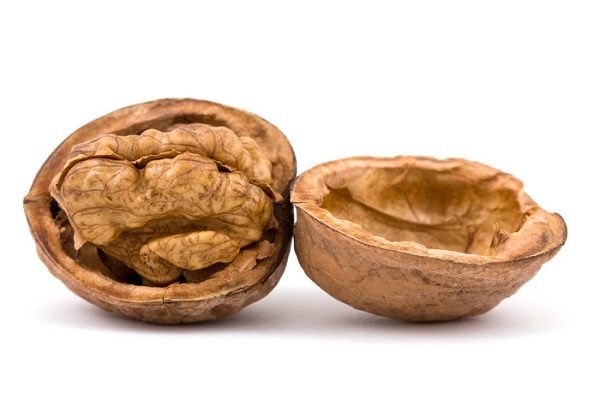 In this corner, A WALNUT. And in the other corner, a Varathane stain pen in Dark Walnut (because it would match the headboard better, not because it was also “walnut”). 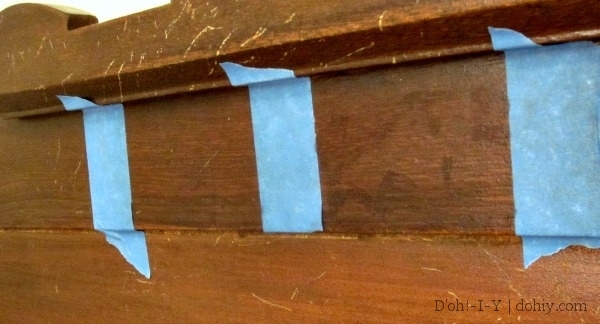 I’ve used both Varathane and Minwax stain markers, and they seem about equally effective to me. I taped off two areas and used the pen on the right and the walnut on the left. To be clear, you rub the walnut meat on the wood, NOT the shell! Both worked, disguising the scratches by color but obviously leaving the scratches themselves in place (these options are not fillers). Even though both did the job, you can see the difference. Perhaps due to my technique, the pen is a little blotchy. I did buff the pen marks as I made them, and a little extra elbow grease will remove the blotchiness that’s there. But look at the walnut side! The scratches are disguised (except the one in the middle that I missed) and the walnut oil leaves the wood looking conditioned. I was so excited about the result that I did another area to the right of the stain marker space. Here’s how this area looked before I started. 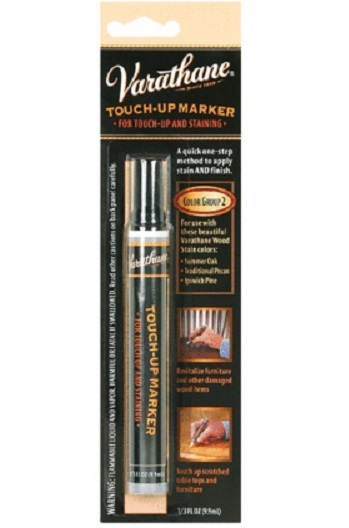 Even better, the walnut option is quick — you don’t have to rub and rub to achieve stain pen coverage, and you don’t need to de-blotch. It’s just a once-over. This whole test, including the extra area, took all of a minute. I’ll admit, I was expecting the stain pen to win by a country mile — I’ve used walnuts before, but only as a stopgap when I didn’t have a stain marker. 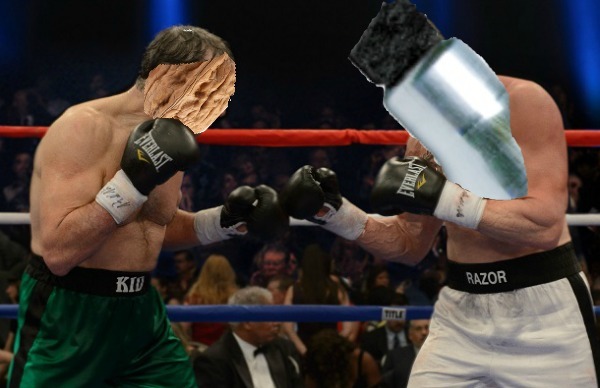 Putting the two options head to head was a surprise — knock-out by the walnut! 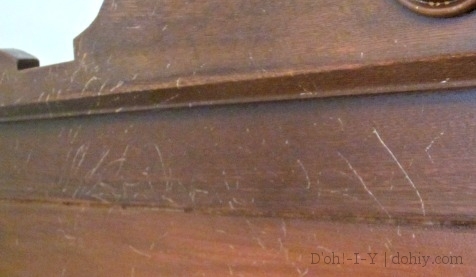 This entry was posted in Decor, Furniture, Repair & Maintenance and tagged best way to touch up wood furniture, stain touch-up markers, using furniture stain pen, using stain markers, using walnut on wood finish. Bookmark the permalink. Thank you for this! Inspired by your results, I used walnuts to touch up the wooden ducks that I inherited from my Grandma. It made me sad that they had gotten scratches during shipping but they look so much better now! That’s twice you’ve helped me, and I have several entries bookmarked for later more complicated work. I’m so glad that the walnut trick worked on the ducks! 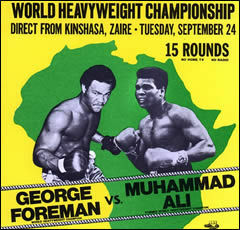 What a cool thing to inherit. Thanks for letting me know that it worked for you, and it makes my day that the blog is helping you out. Stop back and let us know what else you work on!